The recent heavy rains created flash floods throughout Durban with many property owners from Phoenix, counting their losses in the aftermath. Democratic Liberal Congress (DLC) leader, Patrick Pillay said his office was inundated with residents whose properties were affected by the floods. One such resident was Krish Raghubar of Westham, Phoenix whose retaining wall collapsed in the midst of the heavy downpour. Raghubar said that his family was lucky to have escaped the collapsed wall without anyone getting injured. He believes that extra long grass in the adjoining open space and the lack of an effective stormwater system is what caused the flood damages. “I contacted Patrick Pillay to assist in this matter because our area is not serviced. Nobody listens to us when we ask for assistance. We are always told that nothing can be done without anyone making attempts,” said Raghubar. 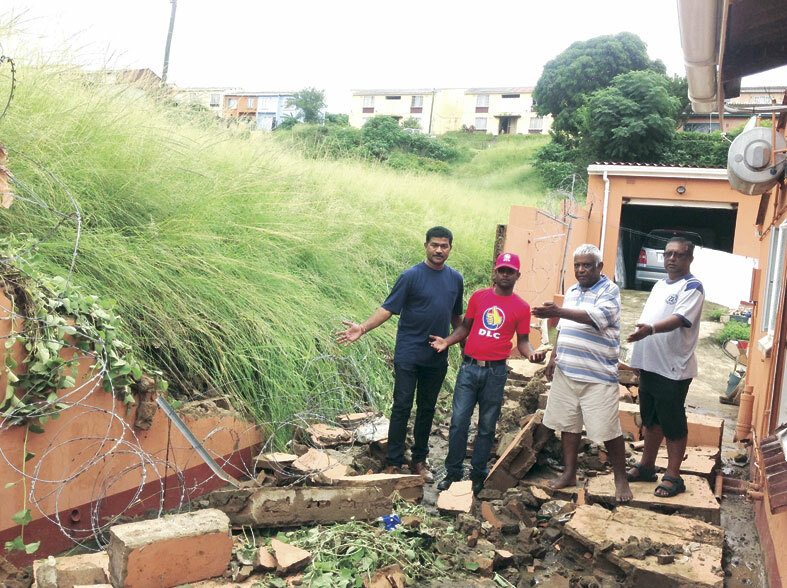 Pillay said, “The municipal stormwater system could not handle the major downpour due to various factors of blocked stormwater inlets, long grass, unkempt open spaces, illegal dumping in open drains, hence a trail of destruction was clearly visible within all suburbs. It is unacceptable for communities to be denied their right to service delivery. Councillors are accountable to the people and must serve them unconditionally.” He said that pensioner headed households and people who do not have household insurances are still reeling from the devastation of the floods. Many resident’s hard earned household property were literally destroyed within minutes of the floods. It was saddening to see the sight of the damages of the pensioner’s wall. R50 million but could be higher as assessments in the affected areas are still ongoing. This was an update of damage incurred and city interventions outine report tabled at an executive committee meeting. According to the report, the amount includes engineering-related costs as well as damage that occurred to properties such as collapsed retaining walls. The report sought to give an account of inclement weather-related incidents which included heavy rainfall accompanied by strong winds that occurred around Durban on 10 and 11 March. The incidents had enormous impact resulting in severe damage to houses, roads, infrastructure and public facilities. A number of wards within the Municipality were affected particularly in the north including areas such as Kwa-Mashu, Inanda, Ntuzuma, Phoenix and Verulam. Many houses were flooded mainly due to ageing infrastructure and the inability of the stormwater drainage systems to contain heavy water volumes thus causing damage to properties. The report further stated that many informal dwellings in Amaoti and Inanda areas, collapsed causing many people to be displaced. The report outlined short, medium and long term interventions to be undertaken by the city. This includes conducting an assessment of damage incurred and categorising the repairs required in terms of the Coastal Stormwater and Maintenance Department according to urgent and emergency repairs.